Water line insurance offers tend to come to us in the mail and look just like an official-looking notice from your local water company saying something like: "Important Information Regarding Your Water Service Line. Response Requested Within: 30 Days." Because this water line insurance is apparently from your water company, the outside of the mailer is black and white, barcoded, and serious-looking. Its appearance is enough to prompt most homeowners into opening the envelope and reading on. In the enclosed letter, you may find out that your "water service line could fail without warning," resulting in financial near-ruin in these hard economic times because it could "cost you thousands of dollars in unforeseen expenses." For a low monthly price, your buried water line could be covered by water line insurance. What's happening here? Has some sort of emergency struck your home or even the entire neighborhood? Why is your local utility company contacting you? First and most importantly, your utility company is not contacting you. This is a private company cloaking itself in the guise of a government agency. The proper name is exterior water service line protection, but its nickname is waterline insurance. The offer is that should the exterior water service line to your property fail, this insurance company will pay your claims to repair the line, from the foundation's edge to the property line (or to the well, should you have private water service). A water service line is only the pipe that brings fresh water into the house and does not include pipes that carry away wastewater. One prominent company, HomeServe USA, offers to pay up to a set annual benefit in claims, broken up into separate calls. Next to having a tree fall on your house or water heater flood your basement while you are on a long European vacation, few home-related problems are as frightening as a plumbing line breaking on your property. Most homeowners have seen homes with front yards torn up and maybe even experienced this themselves. The grass is obliterated because the backhoe has ripped it up. Next to the four-foot-deep trench are masses of sheet plastic covering piles of dirt. Rain fills the trenches. It is not a fast project because dirt-work never is fast. Neighbors or relatives speaking about their problems always quote prices well into the thousands. Hearing these prices makes you glad that your system is working well, and at the same time unleashes the cold fear in your heart that tells you that your house just might be next. HomeServe USA and other water line insurance companies hit those fear notes by telling you, in the mailer, that this water service line is "buried underground on your property [and] could fail without warning." 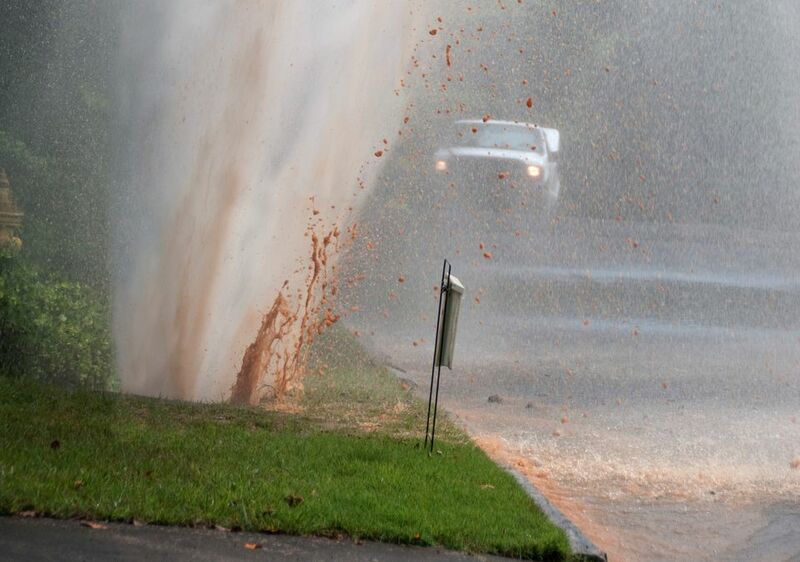 Will Homeowners's Insurance Cover a Water Line Break? Another selling point of waterline insurance is that your homeowner's insurance will not cover repairs or replacement to your exterior water line. Is this true or not? While your insurance may differ, one common homeowner's insurance policy from Liberty Mutual (a GEICO company) states that outside water pipes were not expressly excluded. However, the provision that "[t]his coverage does not apply to land, including land on which the dwelling is located" rules out the possibility that water lines would be covered. The Liberty Mutual policy is all about covering your home, its physical structure, and adjacent properties like garages and sheds. HomeServe USA is not an insurance company. But HomeServe USA is organized under Wesco Insurance Company ("Wesco") umbrella, itself owned by the holding company AmTrust Financial Services. Wesco is essentially privately owned one family: billionaire brothers George and Michael Karfunkel and Michael's son-in-law, Barry Zyskind. HomeServe USA briefly went under the name Home Emergency Insurance Solutions (HEIS) and received its first notoriety under the HEIS name. Even though this is a private company, it further confuses matters that HomeServe USA has a partnership program with municipal water districts, in which HomeServe is contracted out to take care of "home emergencies." When you see a page full of government logos on HomeServe's site, it is easy to think that they have some quasi-official status. This is a doubly sweet deal for HomeServe USA. Not only do the government affiliations provide more business for them but it gives the company a greater air of legitimacy. It is rare that your waterline will break. Hudson, New York's Register-Star quotes Daniel Kenneally, foreman of that town’s Water and Wastewater Plant for 27 years, as saying that it's “very rare” for water service lines to break. He notes that he has never heard of anyone having to replace their water line. Exterior water service lines are freeze-proof and essentially free from accidental breakage. Water service lines are buried over two feet deep and often deeper. All water supply lines are buried below the frost line. If frost is not a concern, they are still buried deep in order to stay clear of normal work a person might perform on a yard. So the question is: What might cause the supply line to break? Water line insurance only covers water supply lines, not sewer lines. Those scary trenches you see in people's yards are usually sewer pipes, not water supply pipes. Many sewer pipes are over a century old and are made of clay. The water line insurance company only offers limited coverage per occurrence. HomeServe USA tailors its plans for each state. So, to use the State of Washington as an example, the company says they will cover up to $6,000 in claims per year. Instead of being generous, this is anything but generous. This provision is only a big trap. Reading on, you see that it is broken up into two occurrences, at $3,000 each. What that means is that your broken water problem must cost $3,000 or less to fix; the remaining coverage events are inconsequential because they apply only to those particular occurrences and cannot be lumped together. You are forced to use HomeServe USA's own technicians. HomeServe USA has its own network of technicians, which limits the pool of available help. If the plumber is not with the company, his work will not be covered. So, not only is HomeServe USA trying to sell water line insurance to homeowners, it is trying to sell you on more home repair services. Other than providing peace of mind for a few dollars a month, you may not find water line insurance a worthwhile investment. Statistically speaking, there is little chance that your water line will break. For that matter, their Exterior Sewer/Septic Line Insurance Protection a bit more plausible, because this is the line that tends to fail more often than water supply lines.